Merrybeth Farm offers an old-fashioned coaching experience for your pleasure. Planning a reunion, an anniversary, a birthday party, or a company event? 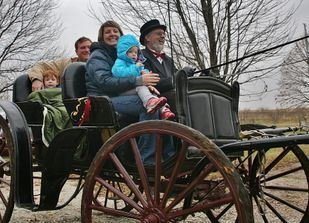 Choose from a variety of carriages, a smaller express wagon, or even a hay rack! Merrybeth Farm has them all. Martin Saupe is the owner and coachman for Merrybeth Farm. We're proud to have him as part of our service. Martin has many years of coach driving experience. He'll ensure a fun, comfortable and safe ride for you and your loved ones. 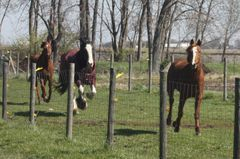 Enjoy a peaceful ride behind our beautiful Clydesdale, Jill or our Morgan team, Rooster and the Dove! 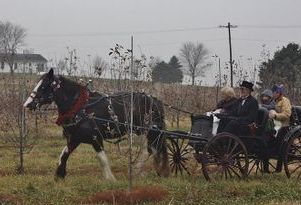 Rooster and Dove are an experienced team and love getting out ahead of one of our carriages. Yes, petting and meeting the horses is part of a Merrybeth Farm ride, in fact it's encouraged. Our horses love making new friends. Imagine a romantic ride, complete with champagne and flowers. Make your engagement proposal unforgettable! 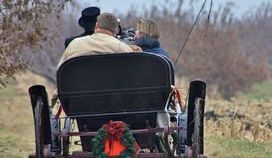 A carriage ride is also a wonderful way to celebrate your anniversary. Someone new in your life that you want to impress? Just call Merrybeth Farm! Our hay wagon and our small express wagon provide great entertainment for family reunions, birthday parties or company picnics. What's better than casual country charm to make the day a wonderful experience. Just call Merrybeth Farm or drop us an email at mb2farm@gmail.com.